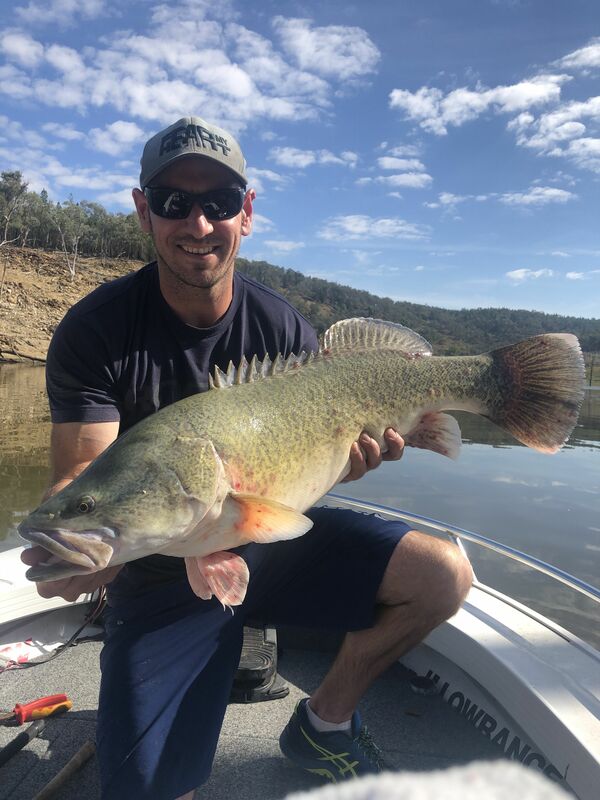 Plan was to leave for Wyangala Dam chasing cod at 3:30am but by 2:30am I couldn’t sleep through a mixture of trying to get out of night shift mode and the anticipation of the day ahead. Little did I know I had a good reason to be excited. Arriving at the dam just after 4am I set up and head off slowly in the dark to where I wanted to start my mornings fishing. The day started slowly as I fished swimbaits as the sun came up with no sign of a fish. There were cormorants and pelicans everywhere a good sign of bait in the area so the fish shouldn’t be far away I thought. As I fished my way along the bank casting as I went I cast to a tree in slightly deeper water and a fish slammed my lure and no hook up. Twice more it hit and didn’t hook up. Across the river was another large tree so I made my way over and first cast bang I’m on then moments later that sinking feeling as the hooks pulled. The two previous missed opportunities showed me a bit of a pattern the cod were relating tight to timber no real surprise but it was the biggest of the trees that held the fish. From then on I set the electric motor on high and purely fished the biggest trees and that’s when the results came. It was 8:50am when the first cod hit the net a solid 72cm cod. After a quick photo and release I was back into it. I fished on and had a couple more missed fish before I hooked up again landing another solid 80cm cod. Again quick photo and release. 10:08am 2 fish so far and the water was starting to get shallow so I was thinking of moving back to deeper parts of the lake but I pushed on. Glad I did. 10:30am I found a group of trees where a drain led into the dam from the surrounding hills. It looked very fishy but I thought it may have been too shallow. First cast was stopped mid retrieve only to miss the hook up. Twice more the fish hit the lure and failed to hook up. I changed angle and cast back to the same area and this time the fish ate it properly boating a 70cm fish. Next cast into the same group of trees was crunched again. I thought surely not the same fish but it was slightly bigger coming in at 74cm. After that I returned to a tree I’d earlier missed a fish. First cast was on the money and it was still hungry only to pay the ultimate price for not retrying after the last fish as the leader broke must have had a nic in the line I hadn’t noticed. Gutted as it felt like a big fish. I fished a few rock walls after that focussing on the steepest sections that had timber on them. Landing another 70cm cod and missing a few more. I fished until dark and landed a 73cm cod on a jackall gigantarel. One of the craziest days cod fishing I’ve ever had. Not because of size just sheer numbers. Ended up landing 6 and lost count of hits and missed fish. I fished a few different lures but majority of the action came on Lucky Craft magnum crankbaits which allowed me to cover water quickly. I fished a shallow diving lure in water less than 4 meters and the same lure in deep diving in the deeper water. Such a nice looking fish. Thank you there is so much more I could of said but I thought that was long enough. Thats a great session Trav, thanks for posting. Thanks @Blackfish was such a fun day. Thanks @nutsaboutfishing wish they could all be as good a day as that. 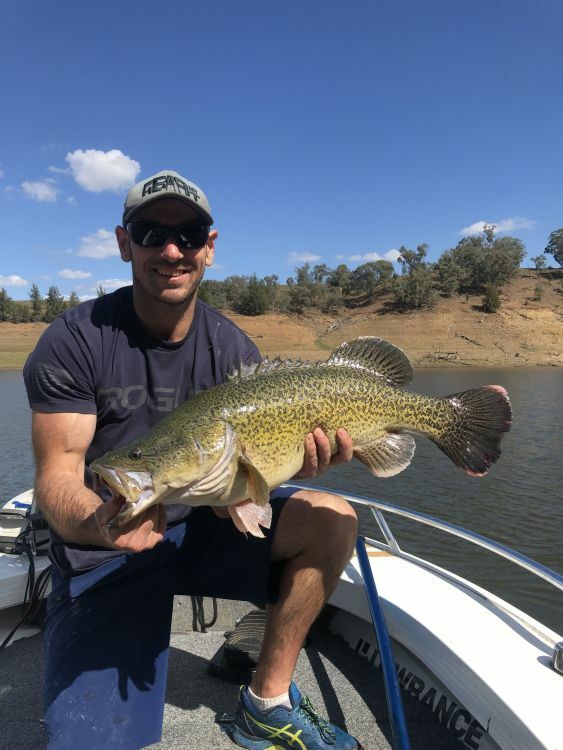 @Welster we definitely have some cool freshwater fish it’s defintely worth having a crack one day. Awesome work and great report Trav! Sounds like a top day on the water! Thanks @big Neil just one of those special days when everything lines up and the fish are switched on. Cheers @Scratchie was a great day. @rickmarlin62 was a great day but not quite as epic as your outing going by the photos. I only dream of landing one snapper that size in a lifetime keep up the good work. @rickmarlin62 yeah it’s a bit of a worry. Hope we get some rain soon.